Thousands of corporate intranets are seldom-used, impossibly complex beasts. In contrast, next-generation intranets are simple, social platforms that can change the way people work (for the better!). But getting to Intranet 2.0 isn’t so easy. Here are my 10 steps. Step 1: Blow up the old intranet. Why? It’s irrelevant to employees’ day-to-day job. The cumbersome updating process alienates people. It’s out of date, and usage is dismal. How? Find the intranet server, get to a command prompt, and type >rm –rf *. (That’s a server admin joke.) Alternatively, unplug it. Seriously, it’s not worth trying to fix; you’ve got to start over. Step 2: Turn users into authors. Why? When readers can also write, the intranet becomes self-healing. There’s no longer any distortion in knowledge transfer. Users feel trusted and empowered. And there’s no excessive burden on a few people. How? Every page should have a big fat edit button. A great example is limestone mining company Graymont. They’re in a staid, traditional industry that hasn’t changed much in a hundred years, but their IT environment is cutting edge. They’ve given everyone the power to edit in their collaborative intranet 2.0 environment, even those who come to work in steel-toed boots and only occasionally sit at a computer. “We believe that sharing information everywhere possible will help us do a better job and be a lower-cost producer,” explains director of IT Ron Ogilvy. Everyone has the power to edit in Graymont’s intranet 2.0 environment — even those who come to work in steel-toed boots. Step 3: Expose the social context of all content. Why? If you know who added a piece of content, where they work, who they work with, and what other content they’ve created, the content is wrapped in a social context. That context makes the information much more interesting and meaningful. How? Expose every bit of social data you can. Rich, self-maintained employee profiles are a great way to do this, linked clearly from each piece of content a person contributes. Intrawest Placemaking, a resort development company, uses “Place” pages: a personal area where each employee can add a profile, upload photos and documents, create pages, and share favourite links. Every change an employee makes to the intranet—every comment posted, every file uploaded, every page added—has the employee’s name by it, linked back to his or her “Place.” Other employees can follow the links, learn about each other, explore each other’s content, and develop relationships. Step 4: Make things findable. Why? If people can’t find stuff on your intranet quickly, they’ll stop using it. How? Support multiple methods to find content. Implement an excellent search, an intuitive navigation structure, and tagging (keywording’s cool younger brother). An effective combination of intuitive navigation and thorough tagging was employed on an extranet for primary care physicians in Vancouver, Canada. For example, to find a lab requisition, a physician can navigate by lab location, condition type, or requisition type. The tags help surface the same lab form in multiple, logical locations. Or they can search. “[Our extranet] is like a medically oriented, locally resourced, primary-care Google,” said one physician. Step 5: Send signals when content changes. Why? When you send signals, it brings people back to the intranet. It keeps conversations flowing; it keeps content fresh. How? When a page is added, edited, or commented on, send a signal to interested parties via email or via RSS feeds. Step 6: Provide scaffolding: a framework to support new content. Why? Some organizations deploy a blank wiki as their Intranet 2.0, but it’s really tough to start with a blank slate. Users need some sort of framework in place to guide content creation. The more scaffolding you provide, the better: it’s easier for users to edit something that’s there than to create from scratch. How? Get an information architect to help define the initial structure of your new intranet. Step 7: Hold a barnraising to populate initial content. Why? Again, it’s really tough to start with a blank slate. Populating content before launch creates initial value, providing a reason for users to visit. That content will also serve as a design pattern, causing other users to imitate what they see. How? Get 5 or 10 people with their computers together in a boardroom. Lock the door, order pizza, and create or migrate content for a day or two. Step 8: Make them use it. Once. Why? Most people don’t want to learn a new application no matter how easy it’s supposed to be. Users have to be forced, just once, to try Intranet 2.0. Once they see how easy-shmeezy it is, they’ll be off to the races. How? In brief group training sessions, get every employee in your organization to click the Edit button. Get them to edit their profile, add a page, add a comment. I was recently on-site at a 230-person web start-up to help them implement our ThoughtFarmer Intranet 2.0 platform. We installed it on Monday. We built scaffolding on Tuesday. We barnraised on Wednesday. On Thursday and Friday, we did a series of 12 training sessions that got almost half the company to click the Edit button. Their intranet 2.0 was an immediate success, with high levels of participation across the organization. Step 9: Lead by example. Why? 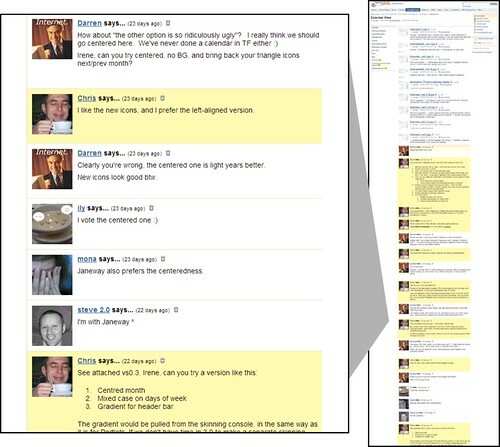 If you can get the senior team to participate in your collaborative intranet, people will pay attention… and imitate them. How? Get one of your senior executives excited about the prospects of a collaborative intranet environment. Get them adding and editing early and often. The more senior the exec, the better – the CEO would be great. Intrawest Placemaking, mentioned earlier, enjoyed the full support of their president, Drew Stotesbury. He took the lead in openly sharing information on their collaborative intranet. Discussions he initiated were often the most popular pages. Step 10: Get the intranet “in-the-flow”. Why? Most intranets are “above the flow”. They store the artifacts of production. But they’re not used for production themselves. 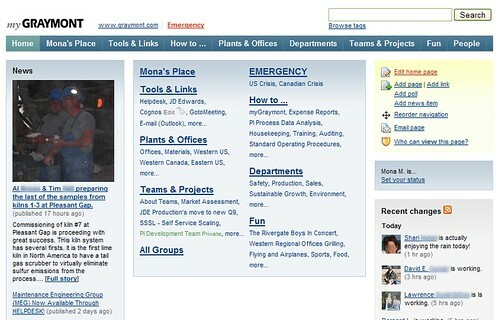 When you can use your intranet as a production tool, to get things done, you’ve reached Intranet Nirvana. How? Use your Intranet 2.0 in the flow. Write documents in your wiki – not in Word. When you’re taking meeting notes, do it live, on your intranet. And if you can’t use your intranet in the flow, change it till you can. 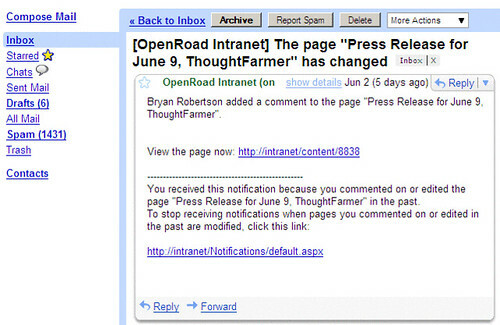 At ThoughtFarmer, we use our ThoughtFarmer-powered intranet “in-the-flow” — we use it to design ThoughtFarmer itself. Sometimes we find ourselves floating back to old ways of doing things, like starting a document in Word. When that happens, we try to discern what it was that caused us to fall back “above the flow”. Intranet 2.0 isn’t easy to achieve. But once you’re there, you’ll never want to go back.